Customers of Mid-Central Federal Savings Bank with non-interest bearing transaction accounts continue to be insured through for up to $250,000 under the FDIC’s general deposit insurance rules. FREE ATM withdrawals at any MasterCard® Debit ATM location (excluding surcharge fees charged by the ATM’s owner). The MasterCard® Debit Card allows you to make withdrawals for purchases directly from your checking account. The MasterCard® Debit Card allows you to transfer between your checking and statement savings account at mostATM locations. All checking accounts require a $100 opening balance. No monthly maintenance charge if $1,000 Minimum Daily Balance is maintained. $5.00 monthly charge if Minimum Daily Balance falls below $1,000. Interest compounded and paid quarterly. $10 minimum balance required to avoid service fee of $1 per month. Monthly statements are conveniently combined with your other checking or MMDA accounts. ATM access allowed to qualified customers. Gifts and awards for consistently saving – it’s not how much, but how consistently you save that counts! Website for educational games to teach 3rd – 6th grade students how to save for their future. Checks may be purchased by customer. Health Savings Account will be written above the signature line. 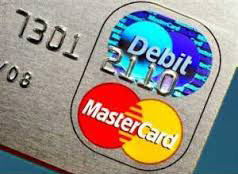 MasterCard Debit Cards are also available for this account. Identification Procedures Requirements: To help the government fight the funding of terrorism and money laundering activities, Federal law requires all financial institutions to obtain, verify, and record information that identifies each person who opens an account. What this means for you: When you open an account, we will ask for your name, address, date of birth, and other information that will allow us to identify you. We will also ask to see your driver’s license or other identifying documents.